A trio of grandkids, whether triplets, siblings of different ages or cousins, triples the joy for grandparents. Those youngsters are celebrated in the 3 precious grandchildren glass personalized Christmas ornament from popular artist Teresa Thibault. 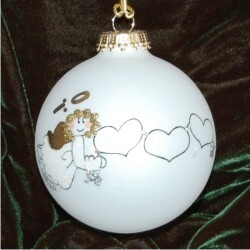 This handcrafted, blown glass ornament features three hearts where we'll artfully letter the names of the grandchildren before adding your personal message. This is one of many personalized 3 grandchildren ornaments from Russell Rhodes that give you wonderful options this Christmas.